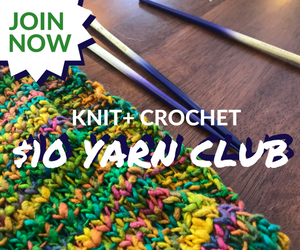 Here’s the weekly roundup of the free and paid crochet, knitting, and sewing patterns I have been sharing over on my Facebook page. 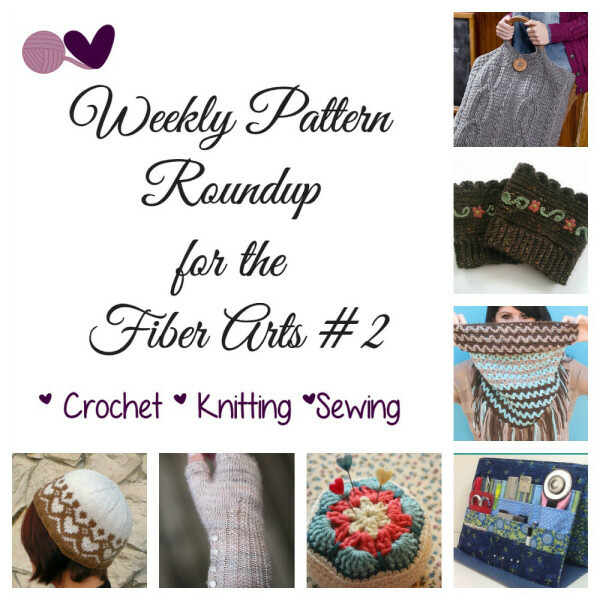 The Weekly Pattern Roundup is an easy way to find something you missed or wanted to save for later. I really love seeing your likes and comments on the pattern links and look forward to seeing some of your finished items. Free African Flower Pincushion Tutorial by Cherry Heart. So making this! It’s too cute and looks like it works up fast. This is a tutorial and it references two patterns, the African Flower pattern and Cherry Heart‘s pattern to make it a pincushion. Plus size cable bag. Free crochet pattern from Red Heart. Wow, this is stylish! 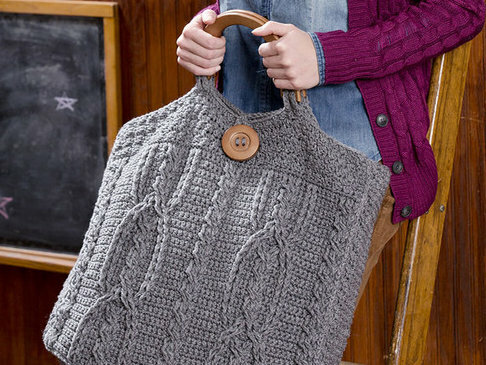 Love cables, this bag is epic! You will need wooden purse handles and a big wooden button. Bonus: MUST HAVE HANDBAGS eBook – $2.99 from: Leisure Arts, Inc. 6 patterns for $3, for $0.50 each and from the Crochet Dude, I grabbed this. I need this y’all. You have to see my purse, it’s so sad. It’s got to be gone by spring! Extra Toppings Please by Mia’s Heartful Hands Free crochet pattern. These boot cuffs are super cute! The pattern linked to shows the boot cuffs without the extra designs as shown on the Ravelry page for this pattern. Mountains Cowl by Gleeful Things – Free crochet pattern. A very stylish and trendy cowl with tassels. I think the color combo shown here with the blue, tan and brown is really sharp. Two versions are available, a large cowl hood and a small cowl. Very nice! Image Credit: ChristalLK on Ravelry. Pride and Prejudice Mittens by Christelle Nihoul. Classy! Paid Knitting pattern available as a Ravelry download. The buttoned cuff of the fingerless mitten is worked flat while the rest of the mitten is worked in the round. Tooly Tool Holder Easel from Sew Together available as a paid Craftsy pattern $5 This is very clever and I think it will come in handy for the sewers out there, painters, crocheters, lots of possibilities. Hold your most-used small tools next to the sewing machine, easy to see and reach. Tooly is also easily portable both within your sewing room AND from home to sewing class/sewing get-together–just fold and go–no more forgetting the necessities.